Congratulations, you finally decided on a brand-new home! Although this is a time to rejoice and feel accomplished, you're not out of the woods quite yet. The last step before starting your new journey is to move out of your old home and into your new one. With so much to do before your move, it's easy to forget a thing or two. Use this moving checklist to stay organized. 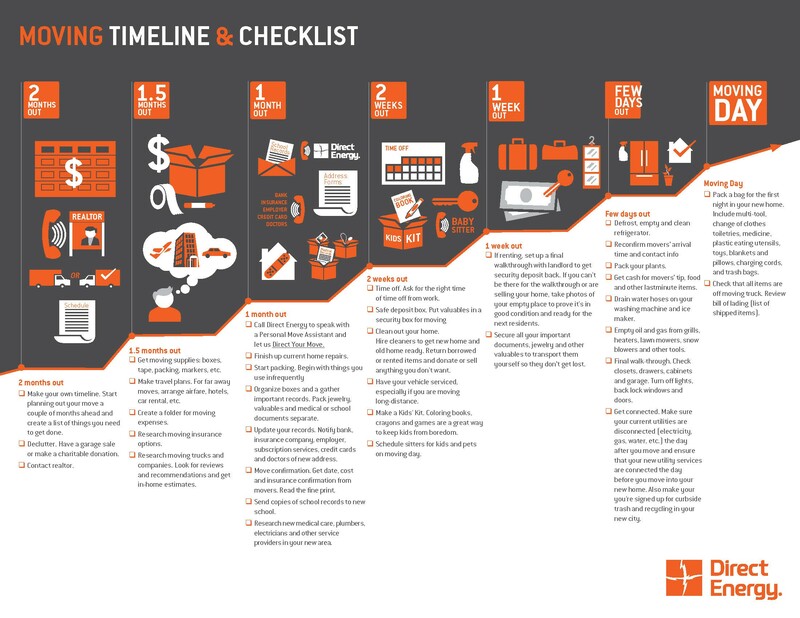 For a printable version of our Moving Timeline and Checklist click here. Make your own timeline. Start planning out your move a couple of months ahead and create a list of things you need to get done. Declutter. Have a garage sale or make a charitable donation. If you're moving out of town, clean out lockers at your gym or children's schools, P.O. box, safe deposit box and any other secure location where you are storing your belongings. Get moving supplies: boxes, tape, packing, markers, etc. Make travel plans. For far away moves, arrange airfare, hotels, car rental, etc. Create a folder for moving expenses, including receipts, bills and other records. You might be able to deduct your moving expenses on your next tax return. Research moving insurance options. If moving insurance is right for you, look for the best way for your family to protect your belongings during the move. Research moving trucks and companies. Look for reviews and recommendations and get in-home estimates for the most accurate pricing. Read our article on how to spot a moving scam. Call Direct Energy to speak with a Personal Move Assistant and let us Direct Your Move. Finish up current home repairs. Start packing early. Begin with things you use infrequently and create a packing schedule to pace yourself and don't wait until the last minute. Organize boxes and a gather important records. Pack jewelry, valuables and medical or school documents separate. Update your records with change of address. Notify bank, insurance company, employer, subscription services, credit cards and doctors of new address. Also, let friends and family know your new location. Move confirmation. Get date, cost and insurance confirmation from movers. Read the fine print. Send copies of school records to new school. Research new medical care, plumbers, electricians and other service providers in your new area. You'll want to have their numbers on hand in case of an emergency. Request time off work. Having an extra day or two to prepare, move or unpack will be invaluable. Safe deposit box. Put valuables in a security box for moving. Create a private inventory of your valuables and where they are packed. Clean out your home. Hire cleaners to get new home and old home ready. Return borrowed or rented items and donate or sell anything you don't want. Have your vehicle serviced, especially if you are moving long-distance. Make a Kids Kit. Coloring books, crayons and games are great ways to keep kids from boredom during a move. Schedule sitters for kids and pets on moving day. If renting, set up a final walkthrough with landlord to get security deposit back. If you can't be there for the walkthrough or are selling your home, take photos of your empty place to prove it's in good condition and ready for the next residents. Secure all your important documents, jewelry and other valuables to transport them yourself so they don't get lost. Defrost, empty and clean refrigerator. Plan meals that will allow you to use any remaining food in your refrigerator and pantry. Donate your extra nonperishable food to Move for Hunger. Reconfirm movers' arrival time and contact info. If you're moving to an apartment, find out about parking your moving truck at your new place and reserving the elevator if necessary. Get cash for movers' tip, food and other lastminute items. Drain water hoses on your washing machine and ice maker. Empty oil and gas from grills, heaters, lawn mowers, snow blowers and other tools. Final walk-through. Check closets, drawers, cabinets and garage. Turn off lights, back lock windows and doors. Get connected. Make sure your current utilities are disconnected (electricity, gas, water, etc.) the day after you move and ensure that your new utility services are connected the day before you move into your new home. Also, make sure you're signed up for curbside track and recycling in your new city. Pack a bag for the first night in your new home. Include multi-tool, change of clothes toiletries, medicine, plastic eating utensils, toys, blankets and pillows, charging cords, and trash bags. Check that all items are off moving truck. Review bill of lading (list of shipped items).